Pest Control - Champion Pest Management, Inc.Champion Pest Management, Inc.
Pest management solutions for your business and home. 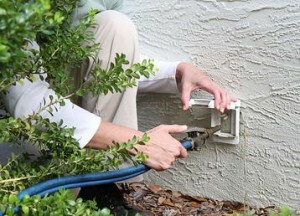 Very first treatment includes both inside and outside perimeter of your business or home. Baits/Dusts applied to all Bathroom, Laundry and Kitchen electrical switch plates. 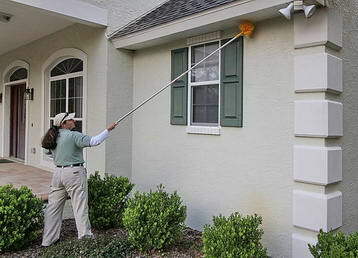 Sweep around all windows/eaves for spider webs, wasp nests, etc. Granular perimeter barrier application around entire house. Liquid barrier around all eaves window/Doorways/entry points, etc. Bi-monthly, Quarterly, Annual for your convenience, all with 24 to 48 hour response time. By treating the exterior of your home or business pests can be stopped before they can ever get inside where they can potentially cause problems and even damage. 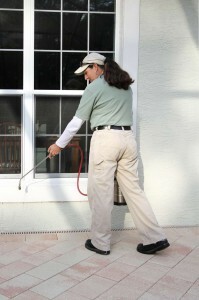 Studies show that 95% of your inside pest problem come from the outside. 100% satisfaction or your money back — If you’re not happy with our services, we will keep working until you are satisfied or we will credit or refund the cost of your last service. We Service All Brands of Tubes in the Walls Systems — A convenient way to keep BUGS OUT of your residential and commercial structures. Our Tubes In the Walls Pest Control System is installed during the construction of your home, providing pest control where most insects harbor and breed. Offering the homeowner peace of mind knowing that their home is free of pests. Treatment applications are performed outside the home by trained professionals on a bi-monthly basis so you do not have to worry about being home to receive the “Tubes in the Wall” treatment service!